A fast-moving fire exploded in Northern California on Thursday, forcing thousands of residents to flee their homes, damaging hundreds of structures and injuring firefighters and civilians as the blaze tore through more than 20,000 acres and barreled toward Chico, Calif., about 100 miles north of Sacramento. By midafternoon, the acting governor, Gavin Newsom, had declared a state of emergency, and hundreds of firefighters were on the scene or en route, said a spokeswoman for the California Department of Forestry and Fire Protection, Lynne Tolmachoff. Mr. Newsom later sent a letter to President Trump asking for federal assistance to aid Butte County and other areas across the state that were frantically fighting infernos. The blaze, named the Camp Fire, burned through Paradise, a town of about 26,000, where a hospital was evacuated and traffic gridlock forced some people to flee vehicles on foot, according to a report on Wildfire Today, a website that covers fire news across the country. “It’s very devastating to the town,” Chief Eric Reinbold of the Paradise Police Department said at a news conference. By late Thursday, fire officials said perhaps as many as 1,000 structures had been damaged; as the fire roared just south of Chico, 15,000 structures were threatened. Jonathan Cox, a division chief with Cal Fire, said at least two firefighters had been injured, as had “numerous” civilians. In the meantime, the fire continued to rage totally uncontained. It was not clear if there had been any fatalities. Cal Fire, said on its website that the fire began early Thursday near the town of Pulga, which is on the western edge of the Plumas National Forest. A red flag warning was issued by the state for a wide area of the county, as strong winds, gusting to 35 miles per hour, and low relative humidity were elevating fire conditions, but Ms. Tolmachoff said winds were expected to ease by Friday morning. 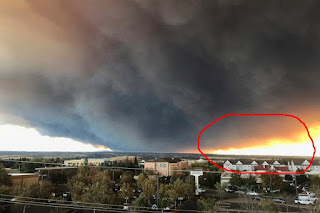 0 Response to "Flash News : As ‘Camp Fire’ Burns in Paradise In California"